We present a 33-year-old male patient with sudden sensorineural hearing loss, the main and only symptom of the second attack, who had been diagnosed with multiple sclerosis (MS) 8 years ago. The patient came to our clinic with a sudden onset of hearing loss and tinnitus in his right ear 1 week ago. Four consecutive frequency sensorineural hearing losses were observed in the audiogram of the patient. Brain diffusion magnetic resonance imaging (MRI) has been reported to result in an increase in the number of plaques and a new plaque in the area of the left temporal lobe subcortical white matter compared to the plaques of many demyelinated, compared with MRI about 1 year ago. As in our patient, brain diffusion MRI, time and location of MS lesions, and evidence of dissemination can provide evidence for MS-related hearing loss in these patients. 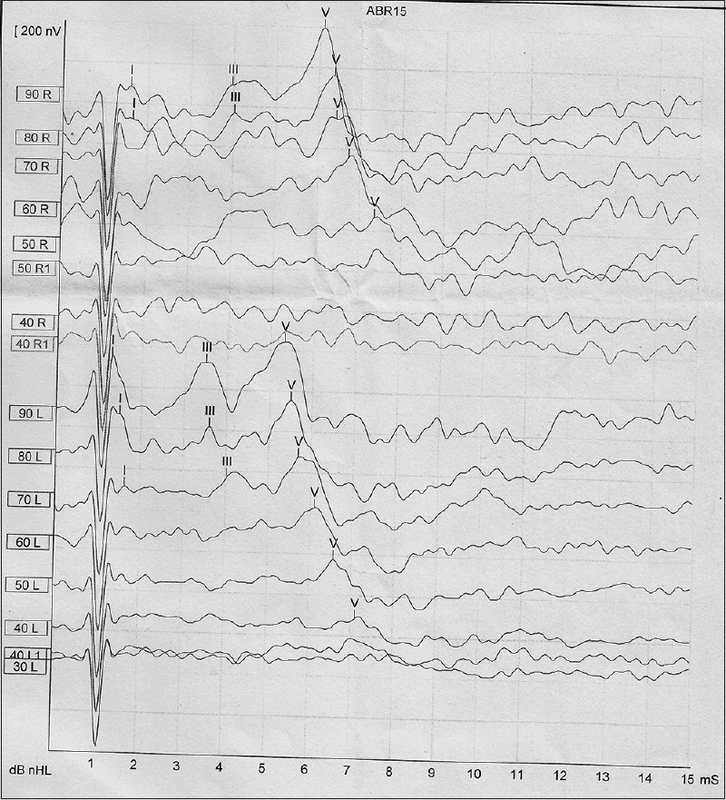 The auditory brainstem responses may also provide important supporting information in this case. Multiple sclerosis (MS) is the most common demyelinating neuromotor disease of the central nervous system, in which has a relapsing-remitting course. At different periods, it affects different regions of the central nervous system, and symptomatology can be very variable. Sensorineural hearing loss in MS patients has been reported in the range of 1.7%–4.3%.,, MS-related hearing loss can occur due to plaques in the brainstem, in any inland where the cochlear nerve enters the brain stem, and in plaques that are located in the auditory cortex (temporal lobe Heschl's gyri 41 and 42 Brodmann areas). Brain diffusion magnetic resonance imaging (MRI) can provide evidence for the history and location of MS lesions, proliferation of the disease, and prognosis of MS-related hearing loss in these patients. The auditory brainstem responses (ABRs) can also provide important supporting information in this case. In this article, we present a 33-year-old male patient with sudden sensorineural hearing loss (SSHL) that remained in remission for 8 years after the first episode of MS, which was the main symptom of the second episode. We discussed the efficacy of brain diffusing MRI and ABR for the diagnosis, treatment, and prognosis of SSHL due to MS.
A 33-year-old male patient admitted to our clinic with a hearing loss and tinnitus, suddenly developing in his right ear 1 week ago. There was no vertigo and peripheral facial paralysis in the patient. The patient was diagnosed with MS with the first attack 8 years before, and MS was informed that he was using subcutaneous administration of Betaferon (interferon beta-1b) 0.3 mg/week/8 years for the treatment, and there has been no relapse in the course. The general ear-nose-throat and neurological examination findings of the patient who had no other features in his history were normal. Bilateral tympanic membranes were normal with the otoscopic examination. In the audiogram, the average right pure-tone average of 38 dB was observed, with 25 dB at 500 Hz, 50 dB at 1000 Hz, 40 dB at 2000 Hz, and 35 dB at 4000 Hz sensorineural hearing loss. In the left ear, pure-tone audio averaged 12 dB for four frequencies. The threshold of speech reception was 30 dB on the right, 10 dB on the left, 95% on the right at 70 dB, and 100 dB at 50 dB on the right [Figure 1]. In the right ABR, elongation was observed in the fifth latency of the left (right 6.1 and left 5.33 ms) and inter-peak latencies of 1–5 and 3–5 waves [Figure 2]. Complete blood and routine biochemical examination results were normal, rheumatoid factor was normal, Venereal Disease Research Laboratory-rapid plasma reagin, antinuclear antibody, anti-double-stranded DNA, anti-citrullinated peptide, Epstein–Barr virus viral-capsid antigen immunoglobulin M (IgM), anti-toxoplasma IgM, measles IgM, anti-herpes simplex virus (HSV)-1 IgM, anti-HSV-2 IgM, and anti-cytomegalovirus IgM were negative, and neurological examination was normal. Compared with the brain diffusion MRI taken about a year ago and the new one, there is an increase in the plaques in between bilateral periventricular, pericallosal white matter, centrum semiovale, and corpus callosum splenium, near the left caudate nucleus. New plaque formation in the area of the left temporal lobe subcortical white matter (this lesion has contrast enhancement after in vivo confocal microscopy [IVCM] injection) and a tendency to merge into the plaques in the left retrotrigonal area have been reported [Figure 3]. During hospitalization, the patient was given methylprednisolone for 5 days at 1000 mg/day with the recommendation of neurology department. A total of five sessions were performed with methylprednisolone (approximately 0.5 mg dose from 125 mg/mL) for the treatment of overt intratympanic steroids. The interferon he received for MS treatment was subcutaneously administered once a week. 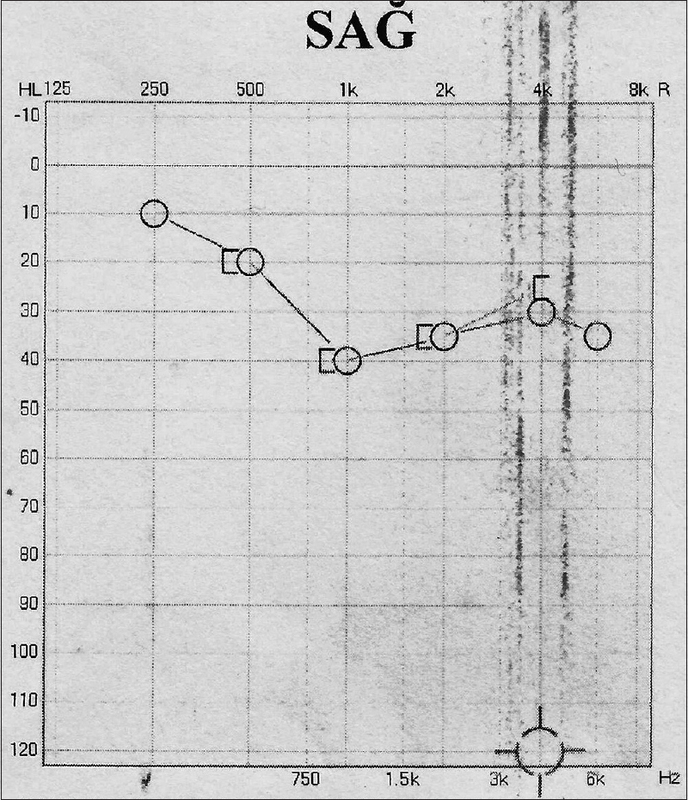 After treatment, 1 week later in the control audiogram, improvement was observed at 5 dB at 500 Hz, 15 dB at 1000 Hz, 5 dB at 2000 Hz, and 10 dB at 4000 Hz at the pure-tone threshold of hearing on the right. In the audiogram about 1 month afterward, improvement was observed in pure hearing thresholds of 15 dB at 500 Hz, 10 dB at 1000 Hz, 10 dB at 2000 Hz, and 10 dB at 4000 Hz [Figure 4]. 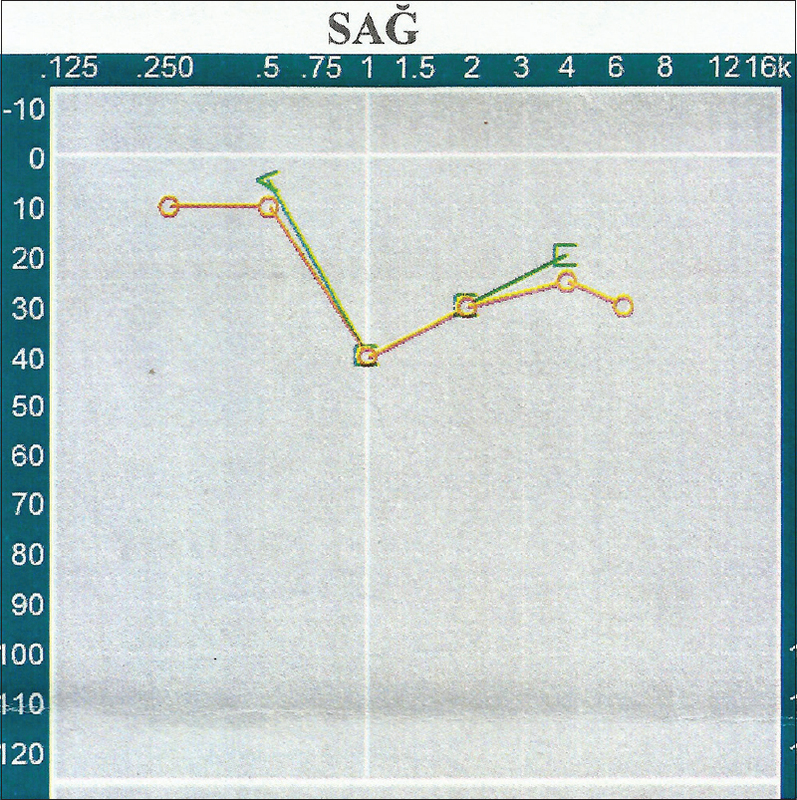 The audiogram results for the 1st year were the same as the control audiogram for the 1st month. Brain diffusion MRI of the brain 1 month after treatment revealed that after IVCM injection in the new plaque area of the left temporal lobe subcortical white matter disappeared. Written informed consent was obtained from the patient for publication of the report. SSHL is defined as a hearing loss of 30 dB or more audiometrically for at least three consecutive frequencies, occurring between a few hours and 3 days., The etiology of the disease is not definite. There are many reasons to be involved in central pathologies in etiology. MS is a demyelinating disease of the central nervous system where white matter is affected. Demyelinated plaques rarely affect central hearing pathways., The auditory cortex is the 41st and 42nd Brodmann areas in Heschl's gyri of the temporal lobe. The sudden hearing loss may occur in the presence of demyelinating plaques affecting this region. 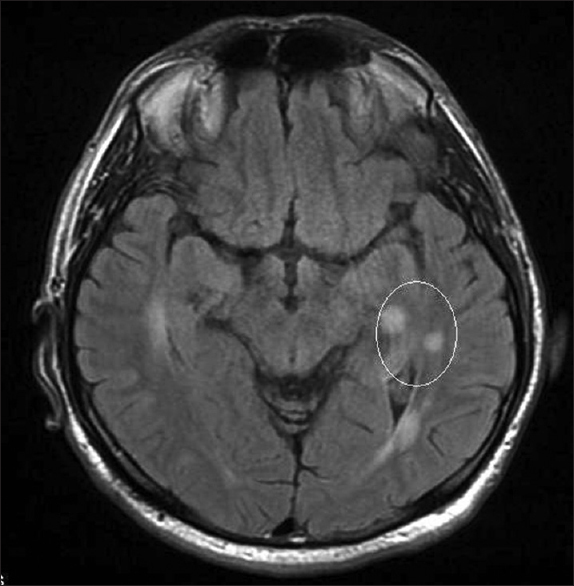 In our case, the loss of activation with hearing after 1 month of treatment with the newly emerging and activating left temporal lobe demyelination associated with Sudden sensorineural hearing loss (SSNHL), which was not seen on previous brain diffusing MRI, suggests that MS causes sudden hearing loss. The most appropriate test for the diagnosis of SSHL in MS is the ABR test., Extension in the absolute latencies of all waves, except the first wave, is the most obvious finding. It is also possible to observe changes in the inter-peak latencies of the I–III and III–V waves or in the morphology and amplitudes of the III and V waves. In our case, ABR also showed elongation in the right ear at the fifth latency of the left and elongation at the inter-peak latencies of the I–V and III–V waves. We also recorded signs of simultaneous hearing recovery with the loss of activation of MS plaques of SSHNL, which coincided with the formation of new plaques due to MS in our patient. ABR and MRI are thought to play an important role in the recognition of central pathologies in the etiology of SSNHL, especially in the diagnosis, treatment efficacy, and prognosis determination of SSNHL due to MS. In the etiology of SSNHL, it is necessary to investigate MS which affects central auditory cortex very rarely. In MS patients, it should be remembered that relapses that can develop in central auditory pathways or in the cortical center of the hearing may lead to SSNHL. Loss of activation in plaques in patients with MS may be a determinant in the prognosis of hearing loss. The authors certify that they have obtained all appropriate patient consent forms. In the form, the patient has given his consent for his images and other clinical information to be reported in the journal. The patient understands that his name and initial will not be published and due efforts will be made to conceal his identity, but anonymity cannot be guaranteed. Tekin M, Acar GO, Cam OH, Hanege FM. Sudden sensorineural hearing loss in a multiple sclerosis case. North Clin Istanb 2014;1:109-13. Leite HF, Leite Jda C, Melo MH, Vasconcelos CC, Alvarenga RM. Deafness in patients with multiple sclerosis. Audiol Neurootol 2014;19:261-6. Hellmann MA, Steiner I, Mosberg-Galili R. Sudden sensorineural hearing loss in multiple sclerosis: Clinical course and possible pathogenesis. Acta Neurol Scand 2011;124:245-9. Schweitzer VG, Shepard N. Sudden hearing loss: An uncommon manifestation of multiple sclerosis. Otolaryngol Head Neck Surg 1989;100:327-32. Cabbarzade C, Özgen B, Sennaroglu L. Radiological quiz. Sudden sensorineural hearing loss due to multiple sclerosis. Otolaryngol Pol 2014;68:264-7. Conlin AE, Parnes LS. Treatment of sudden sensorineural hearing loss: I. A systematic review. Arch Otolaryngol Head Neck Surg 2007;133:573-81. Oh YM, Oh DH, Jeong SH, Koo JW, Kim JS. Sequential bilateral hearing loss in multiple sclerosis. Ann Otol Rhinol Laryngol 2008;117:186-91. Szymańska M, Gerwel A, Cieszyńska J. Sudden sensorineural hearing loss as the first symptom of multiple sclerosis. Review of literature and case report. Otolaryngol Pol 2004;58:1143-9.